ANNAPOLIS, MD (August 11, 2004) – Maryland may have an elusive plant disease lurking in unsuspecting neighborhoods. Sudden oak death, as it is commonly known, is caused by the fungus-like pathogen, Phytophthora ramorum, and has been designated as the Maryland Invasive Species Council's "Invader of the Month" for August. Responsible for the deaths of thousands of oaks and tanoaks in California over the past decade, P. ramorum has now headed East. Many popular landscape plants such as Rhododendron, azaleas, camellias,Viburnum, and lilacs purchased and planted in Maryland since March 2003 could be providing safe harbor for the pathogen. Carol Holko, Maryland Department of Agriculture, says, "Establishment of this disease in Maryland would have far-reaching economic and environmental implications." If P. ramorum were to survive and spread, over 60% of Maryland's hardwood forests could be at risk. Maryland's $1.15 billion nursery and landscape industry has already been negatively impacted by recent events. The name "sudden oak death" is somewhat misleading. Although oaks in the Pacific northwest have been visible and primary victims, the known host range continues to grow and now includes over 60 plants, many of them common in the forest understory and urban landscapes. 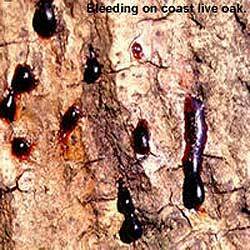 While oaks and other tree hosts develop bleeding cankers on the trunk or main stem that girdle and kill the trees, many other hosts suffer symptoms such as tip dieback and leaf spots. The disease is increasingly being referred to as "ramorum blight", or "ramorum dieback". These foliar hosts may not die from the disease, but can serve to move the pathogen around. P. ramorum can spread via infected plant tissue, soil, and water. P. ramorum is a relative newcomer. As early as 1993, oaks and tanoaks in California and rhododendrons in Europe were dying mysteriously. It wasn't until 2000 that the pathogen responsible for both was identified as P. ramorum. Since the mid-1990's, researchers, regulators, and stakeholders in Europe and North America have been working at a feverish pace to understand and contain the disease. Until 2003, P. ramorum was believed to be confined to native plants in the environment in northern coastal California, Oregon, and British Columbia in North America. In 2002, USDA imposed a quarantine that now includes 13 counties in California and an area in Oregon to prevent its artificial spread through commerce. In 2003, plants in Oregon and Washington nurseries tested positive for the pathogen. Although the introduction was contained and eradicated, concerns about the role of nursery plants in spreading the disease mounted. In March of 2004, the California Department of Food and Agriculture reported that Monrovia Nursery in southern California, far from the quarantine area, had plants that tested positive for P. ramorum. In April 2004 the USDA imposed an Executive Order restricting any California nursery from shipping plants outside the regulated area without being first declared to be free of P. ramorum. Lists of "trace-forward" nurseries, those known to have received potentially infected material from California, were sent to the affected states. Of over 500 camellias, viburnums, and lilacs known to have been shipped to 11 nurseries in Maryland starting in March of 2003, less than 50 remained in stock. One camellia tested positive for P. ramorum. The remaining plants had made their way into Maryland landscapes. In April of 2004, in the course of conducting routine surveys for P. ramorum, MDA discovered rhododendrons testing positive for the pathogen in a retail garden center. Those rhododendrons were traced back to a nursery in Columbia County, Oregon which was found to have infected plants. USDA again distributed trace-forward lists to the states. In Maryland, 18 Lowe's Home Improvement Centers had received suspect material. Of more than 25,000 plants shipped, the vast majority had been sold. "We are deeply concerned about the likelihood that infected plants were purchased and planted by consumers," says Holko. Surveys for P. ramorum in nurseries and the environment are ongoing nationwide. To date, P. ramorum has been detected in 148 sites in 21 states. Remarkable progress has been made by the research community in the four years since the pathogen was identified. Much more work lies ahead. Maryland and many other states share the goal of finding and eradicating P. ramorum in the East, through cooperation between and within all states concerned. In Maryland, anyone who thinks they may have purchased an infected plant is urged to contact the University of Maryland Home and Garden Information Center, 410-531-5556 or http://extension.umd.edu/hgic, for assistance and instructions. For more information about Phytophthora ramorum and other Invasive Species of Concern, visit the Maryland Invasive Species Council.